Have a dirty filter? Don’t be afraid it can be cleaned in a few simple steps. 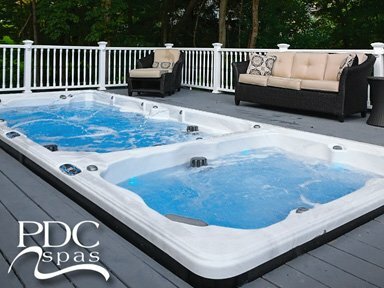 Turn the power off to your hot tub or swim spa, not at the unit but at your breaker. Hook up the hose and grab a scrub brush. Let the water run over your filter for a minute, while the water is still flowing over your filter use your scrub brush to gently scrub any debris that is captured in your filter. Fill a 5 gallon bucket with hot water and a half cup of bleach, submerse the filter in the water and let it soak for 12 to 24 hours. Remove the filter from the water and run hot water over it to clean off any remaining dirt. Put the filter back in the housing and turn the breaker to your hot tub or swim spa back on. Enjoy a soak in your hot tub or a workout in your swim spa with your clean filter! Learn how to clean your hot tub out here.